Wow! 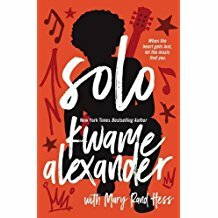 Reading this story of the life of the son of a rocker told in free verse is like getting inside the mind of the main character and wondering if there is a good way out. The two authors tell the tale in a poetic style through a point, counter-point exchange of words and feelings. The son, Blade Morrison, is a part of a very wealthy, very dysfunctional family. He has suffered the death of his mother and survives the many alcoholic/drug induced downward spirals of his father. He has one true love, Chapel, a girl from a conservative Christian family; and he holds on to her as his lifeline. Then his whole world is turned upside down, ad he finds that he no longer has her lover and that he is not even who he thought he was. His search for reality takes him half way around the world. The authors’ use of tying the more famous songs of rock and roll into the tale lends reality to the characters and to the action. Each of the sections referring to one of those songs is prefaced with discography of the song so that the reader may actually hear the words from the artists themselves if they so desire. Telling a tale in a long narrative to young reader of this generation is a great undertaking. Using that style to tell the tale and yet being able to develop other believable characters and to hear their voice in the poem is a phenomenal undertaking. Alexander and Hess have accomplished this feat. The reader will not find sexual scenes or bad language. The book could be used in English classes as a novel/poetry study, but it should definitely be included in the high school library.